WeLoveAnyCar.com: Jaguar Owners: Happy with Indian Ownership, Love their Dealers and….27% will Vote UKIP at the Next Election. Jaguar Owners: Happy with Indian Ownership, Love their Dealers and….27% will Vote UKIP at the Next Election. WeLoveAnyCar.com surveyed 3,896 known Jaguar owners and found they were OK with Tata ownership, Jaguar had ‘massively improved’ and they loved their dealers. 27% Jaguar owners would vote UKIP at the next election and some even want an all-electric Jaguar. WeLoveAnyCar.com carried out a special online survey sent to 3,896 Jaguar owners on 27nd May 2014 revealing some interesting results for Jaguar, their dealers, and even some politicians. We commissioned special research into how Jaguar owners felt about their cars. Tata ownership does not seem to have caused any issues with Jaguar owners. Whilst 5% said they were less likely to buy a Jaguar, 77% thought it made no difference or had no relevance. Indeed, 80% thought Jaguar had ‘improved’ or ‘massively improved’ in the last three years. Since Tata acquired Jaguar, 44% of owners thought it meant a ‘better future’, 32% said there were ‘better cars’ and 22%, a ‘bigger range’. However, 26% of Jaguar owners thought that the company coming under Indian ownership was ‘slightly sad’. Overall, 32% of owners rated Jaguar 10 out of 10 with 84% rating the company 8, 9 or 10 out of 10. Jaguar owners are a class of their own; 86% are aged 50 and over and the respondents were overwhelmingly male – 94%. Jaguar owners are loyal with 30% having owned 4 or more Jaguars. Asked what they felt like owning a Jaguar, 38% of owners thought they were ‘lucky,’ 28% felt they felt ‘very special’ and 26% ‘advantaged.’ Some also felt ‘wise’ and ‘intelligent’ in owing a Jaguar and a significant proportion (22%) felt ‘envied’ and ‘I have arrived’ (14%). In an indication of their mind-set, 27% of Jaguar owners would vote UKIP at the next election, even higher than some recent national polls suggest, with 37% intending to vote Conservative. Jaguar owners are not liberals with less than 1% intending to vote for the beleaguered party. That said, 25% of respondents would ‘rather not say’ or are ‘unsure’ who they would vote for at the next election. Jaguar dealers are clearly helping the luxury car company’s cause with 67% rating the last dealer they visited 4 or 5 out of 5. 46% said they felt ‘welcome,’ 33% ‘comfortable’ and 26% ‘appreciated.’ Jaguar owners were also happy to recommend their dealer but, tellingly, only 44% of them had their car serviced there ‘all the time’. Surprisingly, given the older age profile of the Jaguar owner, 12% said they would be interested in buying an all-electric Jaguar with a range of 300 miles and 26% would seriously consider buying one. Now that the American Tesla has entered the UK with a premium all-electric car with the same range Jaguar should take note. Jaguar - Top Marks - Which One Is This? The WeLoveAnyCar.com car review site continually collects owner views for all makes and models. The Jaguar marque scores highly with an ‘overall rating’ of 4.34 out of 5 which combines ratings given to ‘comfort,’ ‘reliability,’ economy and a series of ratings helping users of the site assess owners’ opinions on how ‘great to drive’ and ‘exciting to drive’ a Jaguar is. 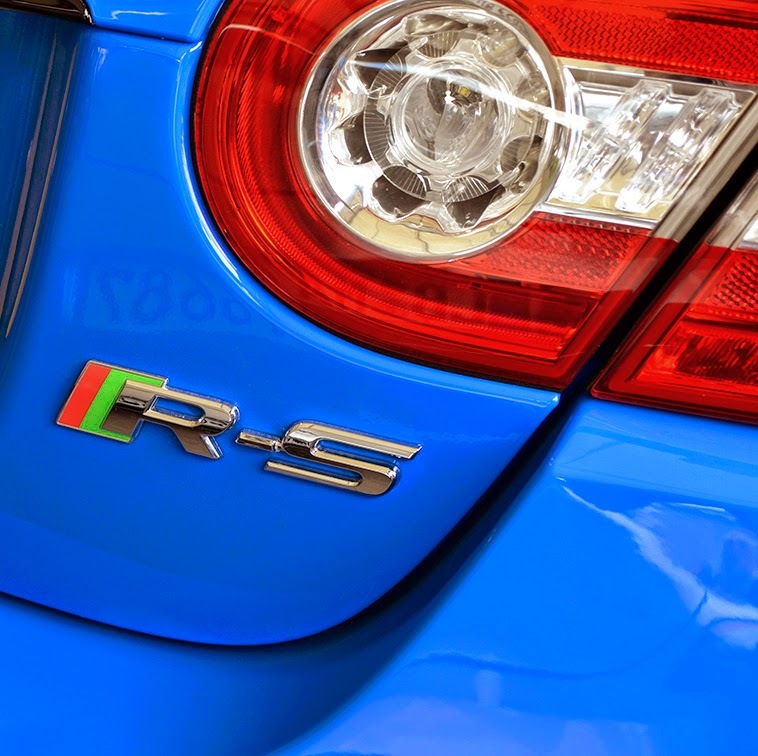 Jaguar has a ‘recommended’ score of 4.53 out of 5 – one of the highest on the car review site. WeLoveAnyCar.com is the biggest car review site in the UK with over 127,500 car reviews submitted in the last 16 months. Each owner is contactable and verifiable. Other owners of the exact same car are asked to ‘agree’ or ‘disagree’ with the review and over 572,626 votes have been collected. 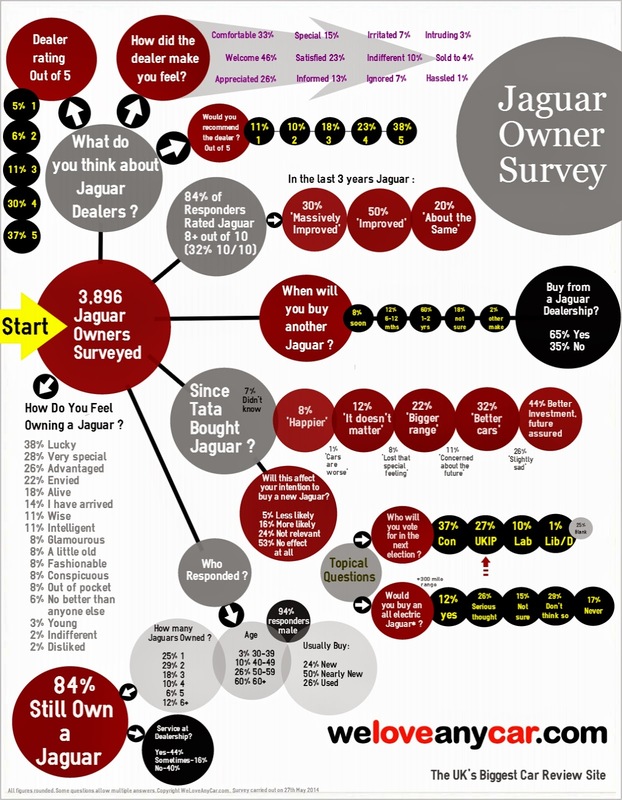 The Jaguar Owner Survey is separate to the Jaguar car review information displayed on the WeLoveAnyCar.com site.